You haven’t heard from me for a while because I’ve been focusing on my mastermind groups, having fun and a whirlwind of completions. You know, those pesky nags that remind you of unfinished business. Years ago, I attended a lecture by the late Zig Ziglar where he gave us his business card – a wooden, round TUIT. Translated: get around to it. Stop procrastinating and take action. Recently, my eyes opened to the big picture of what I’d been tolerating. The broken blinds – hey, they worked if I didn’t raise them. The dangling coat hanger because I didn’t install the molly bolts correctly. The clusters of daddy long legs that resided on my porch and invaded my house when the door opened. Half the burners on my stove not heating well, etc., etc. It was time for change. 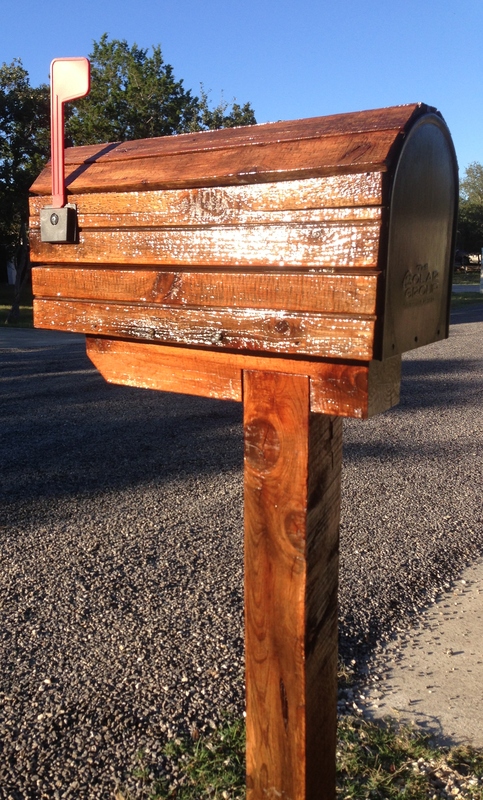 My mailbox I refinished looks great even though I didn’t know what I was doing. I found that projects often come with obstacles and learning curves. Wasn’t I surprised to discover, while proudly using my electric hand sander for the first time, that I refinished my weather-beaten, wooden mailbox with the sandpaper attached inside out. It turned out great anyway. I asked questions only to find that many “experts” give crazy advice and don’t know what they’re talking about but act like they do. However, my intentions eventually drew the right people and solutions to me. I continue to tackle projects in spite of my ignorance. I learn and then I’m no longer clueless on those subjects. Not knowing what to do no longer stops me for long. I’m motivated because stuff left undone as well as unresolved history drain energy making it challenging to focus on goals. Plus, results feel great. Make room for your destiny. Courageously take action. Throw out your holey undies; no, they’re not sacred. Connect with folks you’ve been meaning to contact. Clearing space in your head and environment releases a power for your dreams to come true. Believe in you. You don’t have to know how to manifest your goals or even what they are. If you have that gut feeling that now-is the-time-for-change, then now is the time to get around TUIT. I am grateful to support your choices and see you receiving them!